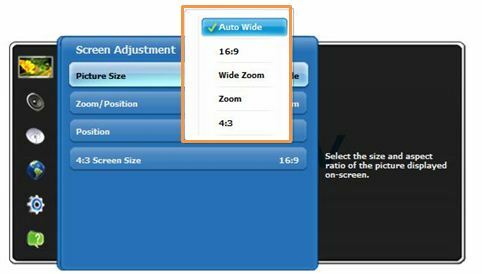 The Picture Size feature allows the user to change the size of the Samsung TV Screen. It may come with five screen size options, each designed to work best with specific types of video input.This is operated by the ‘P.Size’ menu on the remote control. ● Wide Fit : Enlarges the aspect ratio of the picture to fit the entire screen. ● 16:9 : Sets the picture to 16:9 wide mode. ● Wide Zoom : Magnifies the size of the picture on the entire screen. ● Zoom : Magnifies the size of the picture on the screen. ● 4:3 : Sets the picture to 4:3 normal mode. How to connect your TV(LCD, LED, Plasma) to a Laptop?